Orlando, FL, Ka-Blam, August 2011. Urgent Transformation Crisis was the original title of this Internet full-color (mostly by Josh Breidbart) comic strip when it started on August 6, 2007. Now it is just UTC. 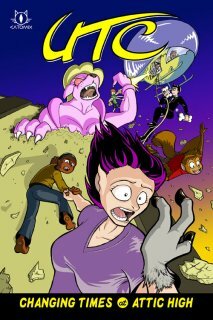 The first trade paperback collection, containing the first four chapters (84 strips, reformatted to 81 pages, to December 18, 2009) plus 9 pages of bonus materials (model sheets, original versions, gag pages, and a two-page afterword containing Whaley’s reflections on developing UTC over several years), is now available in a 6 ¾” x 10” format through printer Ka-Blam’s sales outlet, IndyPlanet. Whaley admits that his cartoony art will never win any awards, but it is perfect for his zany yet poignantly touching tale of unusual teenage transformation. The new Unassuming-Yet-Ridiculously-Well-Funded Private School for Burgeoning Scientific Minds, founded by Dr. Jennifer Attic, accepts only the brightest teenage students with a scientific focus. Dr. Attic’s specialty is genetics research, so the school tends to favor those students with a genetics major. As the story opens, all of the 12th-graders majoring in genetics have to participate in the school’s first annual Senior Genetics Competition. Ash Ackerman has used his gene therapy to prevent incompatible medical transplants to give himself a working third arm. Cashmere “Cass” Calloway has her own gene therapy to alter the pigmentation of specific skin cells, to do everything from changing hair color to creating unfading tattoos. Noah Sonar’s project is intended to give humans desirable animal traits. Demetrius Verttroni is developing futuristic biological weapons, while Dr. Attic’s daughter Keris’ “beautificationizer” will give women a figure to kill for in just minutes. But spoiled 17-year-old Morty Montovarius, the self-styled “DOMINUS of D.N.A? The GENIUS of GENETICS? The MASTER of MUTATION?” (he practices an evil laugh), plans to win the competition by foul means. He sends Genetic Experiment Thirteen, his cute but ditzy catgirl assistant, to give his main competitors a punch spiked with nanobots to turn them into half-animal beings, and a ray gun “borrowed” from another student to turn Keris into an exaggerated parody of a beauty queen. Unfortunately, Keris is holding her pet poodle when she is zapped, and the ray turns her into a twelve-foot-high were-poodle who runs amuck, setting the school auditorium afire. Cass Calloway is the victim of one of his spiked drinks, which turns her into a goat girl, but the other drink accidentally goes to her 13-year-old brother Flint, turning him into a were-flying squirrel. Flint thinks this is cool, while Cass is humiliated by turning into a freak. This takes up the first of the four chapters. The majority of Changing Times at Attic High explores how the school authorities, the other students, and the victims and villain deal with the freakish disaster forced on them. If you were an 18-year-old romantically-inclined girl, how would you handle being turned into a 65% goat freak? If you were a school principal/headmistress, how would you deal with brilliant but irresponsible students who insist on experimenting on themselves and their classmates? If you were an adolescent Mad Scientist, how would you react to being confronted with the responsibility of your recklessness? Whaley develops his theme through a sophisticated blend of exaggerated humor yet realistic dialogue, and convincing emotional angst among his cast, making the reader care for them (well, maybe not for Morty). This volume 1 ends with a satisfactory conclusion, yet leaving the reader wanting to know what happens next to his characters. Whaley says that UTC will resume with “Phase 2”, in comic-book rather than newspaper-strip format, on his website in late 2011. There’s no telling how long it will be until he has enough pages for volume 2, but hopefully it will be soon.